4/13/2016 10:23:00 PM - Linette rocket league pc download Do you specially try your hands right on Xbox 360 game downloads. If yes, are you ready for a word guessing game like none other. What's more, as tablets are touch screen devices, and offer high resolution displays much better than conventional PC's or laptops, you will surely be immersed and yearn for more. 5/24/2015 10:06:00 AM - Barry Red So many ways to screw up the ending... never did beat this one but I did do nearly everything else... Part two was so buggy that I never got far in it either. But what a great game. Actually one of my all time favorites. 5/25/2012 8:46:00 PM - Vox Oh my this takes me back to high school, had picked this game up with a new megadeth tape, and sat in my room weekend after weekend. I never did play the second, can't seem to find it any where. 5/8/2012 7:55:00 PM - Mystery Keeper Not soup. Rotworm stew. 2/22/2012 8:10:00 AM - Lance Ah! The memories! What's that soup called again?!?! 7/23/2011 2:18:00 PM - Mystery Keeper I had problems with summon spell (KAL MANI) in many versions. It not only not creates creatures, but also makes some (vital) NPC vanish. Does it work in this version? 7/2/2011 11:50:00 AM - FreeGameEmpire I have just patched the game to vF1.875S. 6/28/2011 7:27:00 PM - @Druid: Several UW remake projects have come and gone, none of them approached playable before being abandoned. The levels have been made into maps for Unreal, and also Morrowind I've heard but I have not seen those personally. 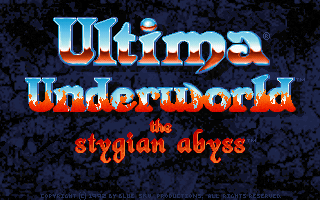 The best thing you're going to get as a modern remake is a game called Arx Fatalis, which was written and pitched as Ultima Underworld 3, but rejected, so remains as a "spiritual successor", very similiar in theme. 6/28/2011 7:18:00 PM - Mike Ratzlaff This is an older version, vF1.50S It has the dreaded inventory bug - if you are playing, and suddenly notice your items have changed into other items (often times ungettable items, like a pool of blood or a spell effect) then you have been struck by this bug. 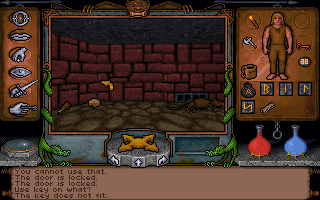 This bug can destroy quest-required items, making the game unwinnable. FGE, please put a patched version of this game up! IIRC, vF1.875S is the latest version released. 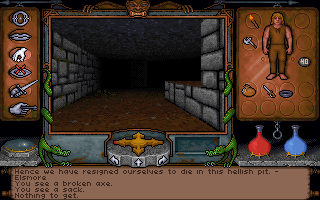 You can see the version by pressing ALT-F7 while in the dungeon. 6/10/2011 4:38:00 AM - Druid Would be great to re-release this with better graphics and smoother gameplay. Kind of like they did with Monkey Island! 2/21/2011 12:10:00 PM - mtvgnoll2 Played this game with friend in college that was some 16 years ago. It still rocks and i never tire of running different types of characters for it. Wish FGE would add the sequel. Unerworld labyrinth of worlds. 8/11/2010 6:39:00 PM - gueran Great game. would be nice that someone change the game into an online playable engine for everyone to play in modern operating systems.